We saw your superb production of Guys and Dolls last night. Thanks to everyone involved for putting on such a wonderful show. 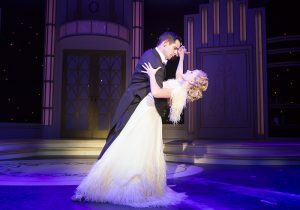 Kilworth House has regularly given audiences its own interpretations of iconic musicals. These have been just amazing. So it was with Guys and Dolls. 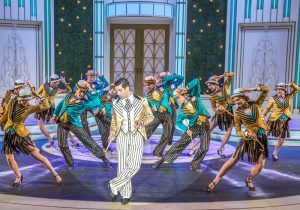 We have become accustomed to watching magnificent productions and last nights kept to the highest standard and confirmed the theatre in the forefront of musical entertainment. 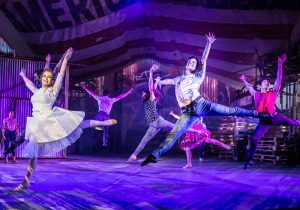 The direction and choreography by Nick Winston was perfect as was the musical direction of Neil McDonald and Philip Witcomb’s set design. Thanks must go to the magnificent cast. Notable, of course were Harriet Jones as Sarah Brown, Simon Thomas as Sky Masterson, Holly Dale Spencer as Adelaide, Daniel Robinson as Nathan Detroit. Every single members of the cast were stars. Long may this wonderful tradition at Kilworth House continue. So looking forward to Joseph in August. Absolutely brilliant production!! Can’t wait to see Joseph now!!!! Yet again Kilworth house theatre put on another fantastic show, never disappoints, Well done had a fantastic night last night. 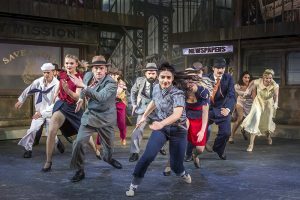 Having just returned from today’s matinee performance of Guys & Dolls I would like to send congratulations to the cast for an outstanding performance. I would also like to congratulate your staff on their high standard of service during the pre performance luncheon. Special thanks go to your restaurant manager Mehmet who ensured we wanted for nothing. All in all it was yet another memorable visit & I’m already looking forward to my next visit. Absolutely amazing tonight totally blown away such amazing talent. Fantastic Show, saw it on Saturday. The singing and dancing was worthy of any London production. I saw G &D when it first came to London in the 50’s. I thought your Nicely Nicely was as good as Stubby Kaye. Again your Adelaide was brilliant it must be difficult to sing in that sort of American, Sister Sarah, Skye and Nathan all had superb voices. Although Sinatra was in the film I preferred your Sky to Marlon Brando. Your Skye looked good and had a voice to match. Well done everyone, be proud you were all brilliant. Absolutely amazing night last night. Stage, cast and performance was perfect. My first theatre experience and will be back for loads more. Fabulous show, went last night, great singing, dancing, orchestra and fantastic set! Had a pre-show meal in the Orangery which was excellent! Superb production – attention to detail in all characters was excellent. Book tickets now to see this fantastic production. We loved it! I can’t imagine how your production of Guys and Dolls could ever be topped, The show had me enthralled from the moment it opened right to the closing number, the casting was inspired each character seemed just perfect for their role, this show offers the very best quality of acting singing dancing and storytelling all of which are brilliantly performed by each and every member of the cast if you only have chance to see one show at Kilworth this year make it this one and I promise you that you it will just leave you wanting more and you will definitely visit again. Thank you to each everyone involved for giving me and our group of friends yet another first class evening we shall never forget, just how you keep raising the bar and standards of production is beyond me this is such a beautiful and intimate setting for a theatre and makes the evening a very special occasion for all. We are bursting with excitement and cannot wait to see the production of Joseph. Thank everyone again. A big thank you for the wonderful entertainment last night. 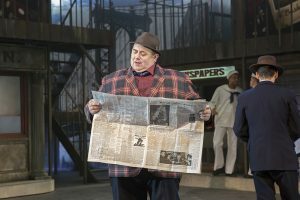 My wife and I absolutely loved last night’s performance of ‘Guys and Dolls’: everything about it was terrific. A special mention must be made of Nathan and Adelaide: we loved their performances and the superb on-stage chemistry between the actors. As ever, the movement, dancing and set design were remarkable. We brought our 12 year old grand-daughter along as her birthday treat and she was entranced. We are now looking forward to seeing ‘Joseph’ later in the summer. The show (Guys & Dolls) was absolutely fabulous, all the cast gave their all and there were some brilliantly funny scenes and incidents, a truly fantastic show and the main principal actors had very beautiful singing voices. Just to say how much we enjoyed Guys & Dolls last night. The standard of performance and quality of the production was simply amazing, making the whole experience extremely pleasurable. We’ve been coming to Kilworth now for eight years, and seen every show you’ve put on. In all that time we’ve never been disappointed; quite how you manage to keep coming up with new ideas and costumes/stage sets is very impressive. Please give a big pat on the back from us to everyone involved in the show. Also, I should mention the efficiency of the ground staff and how effective they are in managing the exit traffic. We look forward to coming to see Joseph in August. 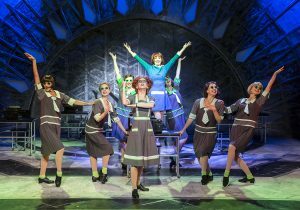 Fabulous and so funny – congratulations Kilworth you did it again. We came to see Guys and Dolls as part of my brothers 50th Birthday celebrations. The show was suburb, easily worthy of the West End. We were staying in hotel and have posted a full review of the experience there. However if you live near enough to travel just to the theatre there are picnic tables and a picnic lawn for theatre goers and a log cabin bar. This is a truly superb facility in a beautiful location. Such an amazing setting. Picnic first then into theatre. First rate helpful staff extremely well organised and a great show. Will be back for Joseph. My wife and I came to watch the performance of Guys and Dolls yesterday afternoon.. and what a performance! Terrific. Please pass on our appreciation to the cast and the production crew. Just wanted to send this personal message to congratulate all those in ‘Kiss Me Kate’ last night. The sheer professionalism made it a most pleasurable night. And who could have known that this indeed was your Opening Night. You should all be very proud of yourselves, every single person we saw and didn’t see. 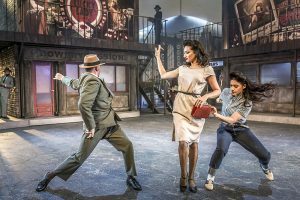 Just to let you know myself and two friends came to see ‘Kiss Me Kate’ last night it was absolutely brilliant the best show we have seen in a long time. Wow! Fabulous! Glorious! Another outstanding visit to our favourite venue – despite bad weather, our return to Kilworth House proved as magnificent as ever; amazing food, fantastic service and another terrific stage production worthy of top West End merit!!! Sincere thanks and appreciation to all concerned. 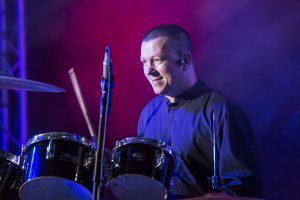 Please know that the Kilworth experience has been one of the main highlights of my working life – such professionalism and support is rare in this industry and you and your team have excelled at every level, from catering, coach parking and exemplary service to outstanding entertainment. Saw it on Saturday… you never cease to amaze me. Lovely day out at Kilworth today. Another great production, professional, fun entertainment. Love this place. This was my first Kilworth House theatre experience. I absolutely loved it. The show and the cast were both awesome. Great night. My friends and I will be back. Thank you. This was far from my first Kilworth House Theatre experience. They never cease to amaze me. I surprised my friends from Wales & Leeds and they loved it. 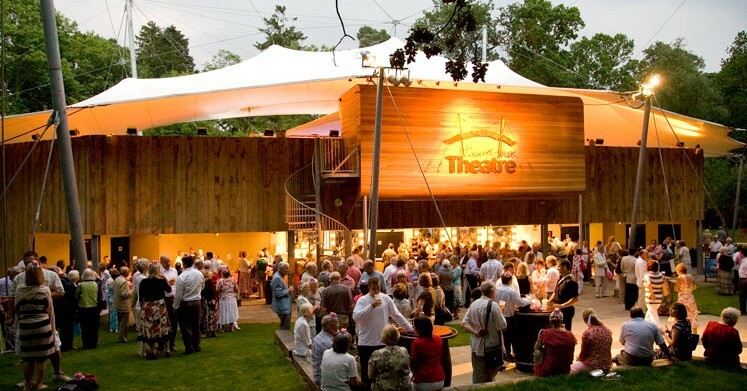 Fantastic experience last night at Kilworth House Theatre watching ‘Kiss Me Kate’, this was our second visit, saw ‘Pirates of Penzance’ and was just as good as the last one, top class cast. If you haven’t been to watch a show here you have really missed out. Just as good as any West End show but in a much nicer location. Never had a bad show at Kilworth House Theatre. A lovely magical experience. Loved ‘Kiss me Kate’ and looking forward to ‘Top Hat’ in August. 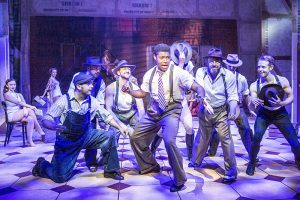 Went to see ‘Kiss me Kate’ on Friday 9th June – thoroughly enjoyed it – cast just having so much fun that it would be impossible not to be enthralled. Never a dull moment, great singing and loads of laughs. Excellent. Picnic beforehand in the grounds a bonus too. Fantastic show, great acting and fabulous dancing! 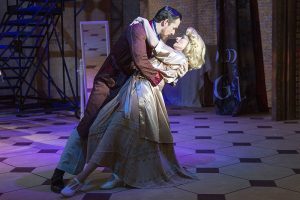 “Fantastic ” ‘Kiss Me Kate’… did not know anything about show. this but the best show I’ve seen at Kilworth, absolutely brilliant! Very professional. I have seen shows in London not half as good as this, do not think twice about going!! if you can get a ticket. Had a great evening with friends watching ‘Kiss Me Kate’ at Kilworth House Theatre. What better way to spend a warm summer’s evening? The performance was very stylish and professional with some great performers. Who couldn’t resist tapping their feet along to “Too darn hot” at the beginning of the second half of the show? What energy and athleticism. A really enjoyable production and can’t wait for ‘Top Hat’ in September. Well done Kilworth House. My wife and I have just returned from yet another amazing spectacle at the theatre. 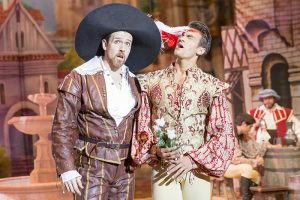 This time ‘Kiss Me Kate’ It was as usual fabulous and could not be faulted. All actors were excellent in their roles, not one weak link. 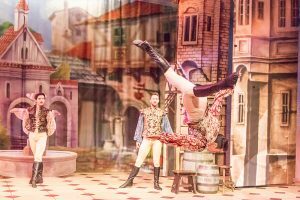 The singing, costumes, dancing – including ballet, comedy , acrobatics and scenery were all first class as was the music from the ‘hidden’ orchestra – a pity they also couldn’t be ‘on show ‘. The scene ‘shifters ‘ were also very professional and unobtrusive. First class again. The whole production team including Celia Mackay are to be congratulated on yet another premier performance. Who needs the London West End when we have our own West End here at Kilworth. We greatly look forward to our next visit. PS. I would also like to say how efficient the car parking officials were on arrival and especially so when leaving. Well done to all of them. Brilliant show, should transfer to the West End. 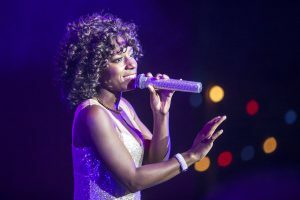 Another brilliant night of entertainment, the stage performance was of a high standard and the singing first class as was the backing singers and musicians, keeping Whitney’s music alive. What a pleasure on a dull, wet evening in summer to be once again enveloped in the glow of Kilworth Theatre’s lights. We were attending the wonderful ‘Manfreds’ concert with friends and had a fantastic evening despite the eventual rain. This is our second visit of this season and we look forward even more to the performance of ‘Top Hat’ at this fabulous venue. We went to the Abba tribute last night and it was great, they sang most of Abba’s music from the early ones to the last ones. We booked a theatre package for the ‘Last Night of the Proms’ concert. Once again it was an excellent production, we chose to go to the Sunday evening performance and once again we picked a lovely evening. The music was an excellent selection of well known pieces and both the soloists were of a very high standard. Not only did the soloists sing beautifully they acted out the characters in some of the pieces they performed. This added humour to their performance. The musicians were also excellent, many adding solo interludes to some of the music. Prior to the performance we had an enjoyable meal in the Orangery, nice choices well served and beautifully presented. We stayed in a Garden room, a good sized lovely clean and well furnished room. The bathroom was spacious with both bath & shower and there was a nice selection of toiletries. The towels were large and fluffy and bathrobes were also supplied. The bed was huge and very comfortable with lovely soft pillows, so a good nights sleep was guaranteed. Breakfast was again served in the Orangery, a buffet with fruit, cereals & Danish pastries. A cooked breakfast was served at the table, a good selection from a varied menu. Tea, coffee and toast were also served. We had a most enjoyable stay in a beautiful hotel with the added bonus of a superb musical evening. Well done once again Kilworth House. We will be back. First visit to the theatre on Saturday for ‘Last night of the Proms’. Truly amazing production, great venue, helpful staff and we’ll certainly be booking again. Been twice this weekend and not disappointed on either day. Saw the absolutely brilliant ‘And Finally Phil Collins…’ on Saturday. Hope they come back next year, and on Sunday we saw ‘Beyond the Barricade’ – another good show. Fantastic night went back to my youth ‘Rock n’ Roll Paradise’ were absolutely fantastic. My first time at Kilworth House it won’t be my last. Went to the ‘Frankie Valli & 4 Seasons’ show. Fantastic, Kilworth have done it again. “I am writing to express my gratitude to the performers, the band and the stage hands for Sunday’s performance. It was absolutely superb! The cast were brilliant. The band excellent. Please pass on my thanks to them. It was a wonderful “English” evening! “Saw ‘TOP HAT’ last night and it was excellent. Great singing and dancing. Love the tap routines and seeing wings done. Pre-theatre dinner was very good took. Very efficient staff attending a number of guests. No-one kept waiting and a good selection of courses. Great show tonight Kilworth House Theatre does it again. Thoroughly Modern Millie was superb. Song dance and loads of humour. I was there last night on the opening night. The show was absolutely fabulous. It was like a West End performance. So professional. Well done everyone. First time we’ve been to the second show of the season and not disappointed! Fun, fast and funny. Fabulous! Didn’t see any gaffes on their second night. Looking forward to next year! Last night’s show was truly magnificent. Performances, costumes, set were absolutely brilliant. And full of lovely, clever touches. The typing/tap sequence was one of the best pieces of stage choreography I have seen anywhere. Yet another fabulous evening’s entertainment. We cannot wait for next year’s productions . Thank you. We went to celebrate our 25th wedding anniversary. First time we had been. Show was fantastic very professional West End standard would recommend. 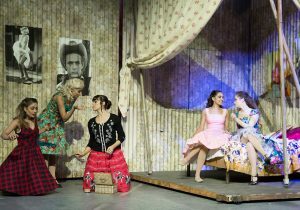 I just wanted to write and say how truly fantastic last night’s show was, West Side Story. 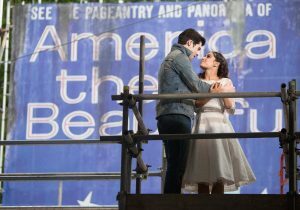 My husband and I have seen a few shows at Kilworth House Theatre and they have all been brilliant but the West Side Story performance was exceptional. The main characters Tony and Maria were perfect, a very emotional performance that had me in tears a couple of times. Our visit was a Christmas gift from my daughter and son-in-law that included a pre-theatre meal in the Orangery. We enjoyed a lovely 3 course meal in beautiful surroundings, all the waiting staff were happy and attentive. My husband and I highly recommend the theatre experience, you can also book tickets for the theatre and take a picnic, there are picnic tables in the grounds which would be a great idea on a summer’s evening. Thank you all so much for the entertainment and wonderful service, you all truly deserve such praise. Just arrived home from seeing the first night of West Side Story at the Kilworth Open Air Theatre. They always have wonderful productions here but this performance was absolutely outstanding. The weather could not have been worse! The rain was torrential and relentless, and the performers are required to enter and exit the stage throughout the show… into the elements. Despite this, they gave a first class performance, equal to anything on the West End. What a talented troupe…thank you! 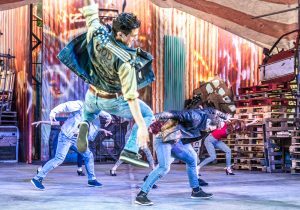 Many, many congratulations to all on an amazing first night performance of West Side Story last night – such energy! We were lucky to get tickets from a cancellation for the opening night of West Side Story. Despite torrential rain, the performance was exceptional and faultless. If you already have tickets to see this fantastic show, you will not be disappointed. The principals were all sensational and the choreography superb. Absolutely up there with anything you could see in the West End. Fantastic! 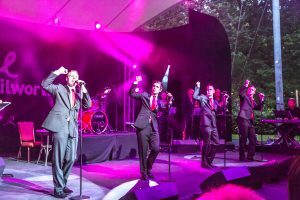 We have just returned from another wonderful evening of entertainment at Kilworth House Theatre. 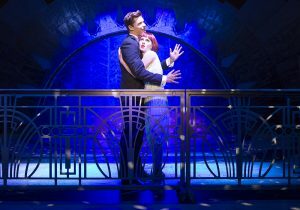 Kilworth’s shows never fail to entertain and rival anything we have seen in the West End. The set, casting and level of performance for this show were first rate, so if you love musical theatre and haven’t yet visited Kilworth take my advice and get along there, I guarantee you won’t regret it. 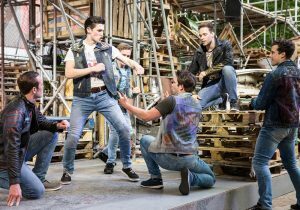 I was at Saturday’s matinee performance of West Side Story (my first ever visit to Kilworth). All I can say is thank you very very much for a totally marvelous day and may I say what a perfect venue. ALL of the staff were incredible and of course I have booked for future shows. You all deserve the highest possible praise for getting everything RIGHT, be very proud of what you have achieved. Saw it today, totally blown away! Well done to everyone!! Love it!! Lovely, saw this today, got goose bumps. Just messaging to say that West Side Story was absolutely brilliant!!! The best yet! 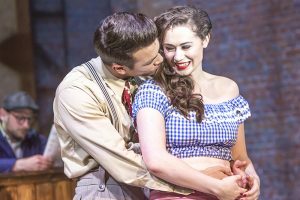 West Side Story has an emotional plot and the cast of this production didn’t fail to bring out every last drop. Exceptionally high standard of singing and dancing, especially Maria with the voice of an angel. All the young cast worked really hard and provided a memorable evening for the audience – thank you! Visited this outdoor theatre to see West side story. The whole experience was fantastic. The setting was perfect on a warm summer’s evening, although it chills down later on and you may need a blanket which you can hire from the venue for a nominal fee. The grounds offer beautiful scenery along with areas for picnics, the staff were friendly and helpful. Finally and most importantly the show was a huge wow. Just arrived home from the matinee of West Side Story. What a wonderful performance. The singing, dancing & music was incredible & I don’t think it could be beaten in the West end! Amazing night at the Björn Again concert great music, fantastic party atmosphere, brilliant seats. Kilworth you just keep producing the most fantastic entertainment in the most friendly and intimate arena. See you again Saturday for Paul Carrack. Amazing concert last night from Paul Carrack, he makes such an easy professional, the man was born to make music as a fan and a member of the audience this is by far the greatest venue to come and watch Paul, so intimate, so professional once again thank you Kilworth. Just to say what a fantastic evening Saturday was. Paul Carrack and his band were absolutely brilliant. We started with a great picnic in your grounds and it culminated in an absolutely stupendous concert. Thank you to all. Went to see Beyond the Barricades which was amazing, excellent, superb. The show was 4 singers all of whom had been on the West End stage and sang a selection of songs from various musicals. Couldn’t recommend it highly enough. Will definitely be going again. We have been visiting this wonderful theatre since it opened and have seen most of the shows. Productions are always excellent. This weekend we saw Paul Carrack in concert which was a real treat. The picnic area is very pleasant but can get busy so might be worth taking your own chairs just in case no tables are available. After dark the lighting in the trees makes this a truly magical place. Went here Saturday night to see Paul Carrack, first time for me but thought it was excellent. We went early so we could have a picnic which was very nice as they have tables with parasols if you get there early enough. The show was booked up very quickly and we could only get the back row but the view was good and the seats were well spaced so it was not a problem. Paul Carrack was very good and the acoustics were also very good. I was very impressed with the whole place, will definitely be going again. If you’ve not been to this open air theatre you’re missing a treat. Go an hour early and take a posh picnic (benches and umbrellas provided) park close by then spend a magical time watching a show, be aware you need to book tickets early in the year because they are in great demand. What an amazing venue, we are so lucky to have this in Leicestershire. Open air which makes it very different, good seating and brilliant atmosphere. Lots of great shows on here, we saw Rock n Roll Paradise, most enjoyable everyone having a super time. It’s a very different environment for a theatre but in a good way, thoroughly, thoroughly enjoyable. Fantastic grounds where you can take your own picnic before the show, we opted to stay the night in the very beautiful Kilworth House Hotel, well worth doing. Set in its own little woodland grotto there is something here quite magical, especially on a balmy summer evening. However, it is also a very good, intimate theatre and show stage and when we sat front and centre to be within touching distance of The Manfreds belting out all of their 60’s hits it was quite brilliant. I bet Shakespeare is good here too. It was a fabulous opening night and loved the ending!! Another great show, they just go on getting better and better!!! You really know how to put on a show. Congratulations to you all. Can’t wait for next year’s programme. Hello, I just wanted to thank everybody for a very enjoyable evening when myself and my wife visited the theatre (for the first time) on Sunday evening to see Singin’ in the Rain. It was a birthday treat for my wife and it couldn’t have gone better. Please pass on our thanks to all of your staff from the car park attendants, ticket collectors, bar staff and managers. Also if you could get word to the actors, the orchestra and everyone involved in putting on such an amazing performance I would be grateful. We attended the performance yesterday, 4th June, and felt we had to write to say how amazing it was. This was the best production I have seen at Kilworth, it was the first time for my friends, we could not have chosen better. The dancing and singing was superb. The whole cast sang and danced their hearts out. Special mention also to the costume and set/special effects people. Once again thank you, this production was, in my opinion, as good as anything I have seen on the West End. A great performance fabulous cast. Thank you for a lovely afternoon. Congratulations to all concerned, you’ve done it again! I and a group of friends came to the matinee performance last Saturday 6th June. What a fantastic show (although I haven’t seen a bad one yet), so full of energy and fun. Please pass on our thanks to all of your staff from the car park attendants, ticket collectors, bar staff and managers. Also if you could get word to the actors , the orchestra and everyone involved in putting on such an amazing performance I would be grateful. Went to see this last Friday with my husband. Was stand out, amazing! All the cast were exceptional. Loved it. Have recommended to everyone. We were at last night’s show; another fabulous production and performance and another relaxing overnight stay at Kilworth House; thank you to all; see you next time. Watched the show last night. It’s an absolute MUST to go and see. The whole cast are brilliant. So much talent the singing and dancing are wonderful. Loved the tap dance in the rain ! Will be booking seats again. Anne Newby Peck – Facebook. I can’t begin to tell you how much my chums enjoyed our visit to Kilworth yesterday afternoon. Everything was perfect – perfectly English. The meal was super and the service THE BEST and the Show… W-O-W incredibly amazing – star-studded… talent beyond belief – beats the West End into a ‘cocked hat’. I had 55 deliriously H-A-P-P-Y FRIENDS all wanting to come back next year… I would really appreciate if you could pass my feelings on to the management, all the team and all the amazing cast… PERFECTION. So let me be first to know what’s happening in 2016. Singing in the Rain (Saturday afternoon) was a wonderful, bright and very uplifting performance. My family were amazed at the brilliant production and all enjoyed being roundly entertained. Congratulations to all concerned. You will see bigger in the West End but not any better. Fantastic show, saw it yesterday, brilliant as always. Last night my fiancé and I came to see your performance of Singin’ in the Rain. We are getting married next month and decided to treat ourselves to this as a break from all-things-wedding! A big thank you to all involved in making it such a wonderful experience. Our thanks and congratulations for turning my bunch of recalcitrant pensioners into happy smiling teenagers again after Saturday’s performance of their favourite and fondly remembered musical film. 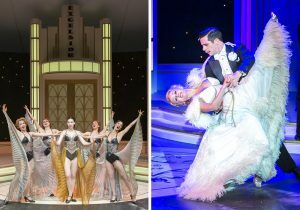 The ghosts of Gene Kelly, Donald O’Connor and Debbie Reynolds can delight in this live wonderful performance by your company in this special place you have created at Kilworth. To walk down the hill after a fab lunch (even in the rain) through the glade is an experience in itself. Then to find that Hollywood has been born again!! The set and casting director should have a medal, the stars, dancers and all the cast were superb. Fantastic show as were the costumes and musicians, West End eat your heart out. Thank you for the Priority booking and fab seats! Once again you have increased your Norfolk fans. We will be at Kilworth again same time next year and look forward to hearing from you about next year’s programme. 56 seats please – I found a bigger coach. Once again, our sincerest thank you for a wonderful show. Keith Oldrey, Probus Travel Norwich. Absolutely fantastic. Saw this show yesterday. Brilliant visit, once again, to the magnificent Kilworth House Hotel – it just gets better and better! Divine dinner in the beautiful Orangery and wow! What a show at the marvellous state-of-the-art theatre in the forest! It might have been entitled “Singin’ in the Rain” but we were lucky enough to be singing in the sunshine ‘cos the weather was perfect! As for the calibre of the musical – sensational! I came to the show with a friend and we both absolutely loved it!! Thought it was totally brilliant, loved the tap dancing, singing and thought the lead roles were amazing. We laughed our heads off, very very funny show so we came away happy. Went to see Singing in the Rain. Clearly Kilworth House Theatre goes from strength to strength in attracting the very best entertainment. This really was a most polished production with a seriously talented cast. All performed in what is a fantastic facility. One of the best shows I have ever been to including many in London. Congratulations to all involved in putting on this show. My wife and I saw Legally Blonde last night with some friends and we thought it was fantastic. And from the buzz amongst the audience as we made our way to the car so did everyone else. We have been to shows at Kilworth House several times and Legally Blonde was definitely the best. 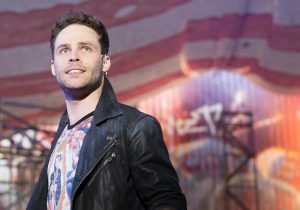 The acting and singing was superb, the script contemporary/edgy – really good. And the production and staging was as good as any West End show. We came to Kilworth last night to see Legally Blonde, HOW BRILLIANT WAS THAT! We had a nice picnic beforehand, in brilliant weather, no RAIN! Then the show. Congrats to everyone for a magical evening. The Irish dancing scene was so funny. Such an energetic lot of performers. I shall be practicing my ‘bend and snap’. On your mailing list for future shows. Keep entertaining us in superb style. Just got home from watching this – absolutely fantastic! What an absolutely stunning show tonight! Well done to the cast, backstage crew and the theatre management!!!! Last night was my first visit to the KHT to see Legally Blonde and I have to say what a brilliant experience it was. The set up is fantastic and you really feel part of the show. The large bar is superbly positioned, the toilets are large, modern and clean, and everything else is just right. Why bother with a train fare and extortionate West End ticket prices when you can come here and get at least as good an experience. 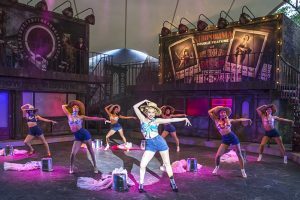 As for the show, well the cast were all top quality and extremely energetic with the lead, Jennifer Harding, being the stand out performer – great singer and world class performer. Enough said. Another excellent show at Kilworth House Theatre; thoroughly enjoyed it; brilliant performance by all the cast. Thanks!! It was brilliant, thank you to all the cast for such a fab night. Amazing show!! High energy, loud and colourful!!! Fabulous show. Well done to all the very talented actors and actresses. Already looking forward to next year. Wow! Marvellous cast , engaging, professional , passion, performance, absolutely the best and well deserved standing ovation ! Well done to all. My wife and I came to the performance of ‘Sister Act’ last night and I wanted to write and say what a magnificent night’s entertainment it was. The music and performances on stage were nothing short of fantastic. It is safe to say that the entertainment value and quality of experience we got last night would be difficult to get anywhere in the West End [for not much less than three times what we paid]. It was absolutely brilliant. I know it is a cliché, but yet again I found myself coming out at the end of the evening, shaking my head and saying to my wife: ‘How have they managed to produce an even better show than last time?’. Long may it continue. We can’t wait to find out what next year’s shows will be! Thank you very much”. Just been to see ‘Sister Act’ was Absolutely fantastic, anyone going to see this show are in for treat. The cast, choir and staff were amazing”. I’ve just been to see Sister Act this afternoon & what a fabulous performance! I enjoyed every single second & didn’t want it to end. 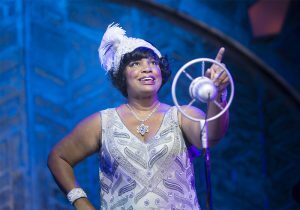 The actress that plays Deloris was outstanding. She nailed it, as did every single person on that stage. One of the best performances I’ve seen for a long time. Definitely 5 stars!!!! Went last night with my husband. It was the first time we had visited Kilworth house theatre so didn’t know what to expect. We were not disappointed! What a fabulous evening! From the moment we entered the theatre the staff were friendly and helpful. The blankets provided came in handy as was a bit nippy! We were literally blown away by the performance. Praise to all those involved! We wanted to watch again. Will definitely be back! We came to the Saturday 6th September matinee of Sister Act, another great show, and another lovely afternoon. You never disappoint. The whole package, venue, staff, meal and show, all FIRST CLASS. We discovered your venue just by chance a few years ago and what a gem it has turned out to be. Roll on next year, can’t wait to know what is in store for us! Sister Act last night was absolutely brilliant. Certainly up to the standard of any West End show I have seen. All the cast performed outstandingly and the singing was superb. What an incredible vibe!! Wow! What a show! Everyone really enjoyed it. Congratulations to all concerned …everyone is looking forward to the announcement of next years shows. Thanks again and very well done on every aspect of the show. Came to see Sister Act on Saturday, surprise present for me and family. What a present it was fantastic and wished I could have seen it again and again, absolutely brilliant. I will be looking to see what shows will be on at Kilworth for 2015, can’t wait, thank you for such a wonderful evening. We went to opening night of South Pacific and it was incredible. 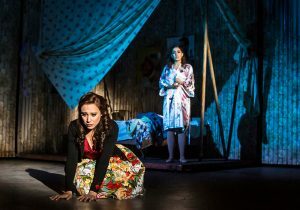 Very clever staging, excellent performances from all the cast …wonderful songs. ..there is something magical about watching this in the open air. Very professional and does rival the West End… a fabulous evening. Good value for money, West End quality for local prices. Really enjoyed South Pacific at Kilworth House Theatre, excellent production (London quality) set on a unique stage nestled in the countryside…very special. What an amazing performance on Saturday evening…you were all truly fantastic ..looking forward to seeing you all again on the 21st of June …well done. A big ‘thank you’ for such a wonderful show. It is the third time we’ve been to the Theatre and it seems to get better each time. Please pass this on to Celia Mackay who with her wonderful team and hard work produced such an enjoyable and entertaining show. What an amazing production! Once again Kilworth House have excelled with South Pacific – can’t wait until August when we are coming to see ‘Sister Act’. Lovely night at Kilworth House Theatre last night! Great show!!! Congratulations everyone! What can I say – South Pacific – Loved it! Just wanted to say what a fantastic production yet again! We have been coming to Kilworth since the first year and always come away thinking you can’t beat that! But you always do! What an amazing performance on Saturday evening…you were all truly fantastic! Fantastic watching South Pacific last night. The whole show was so good I could watch it again and again. A great performance from true professionals as usual, well done to them all!! Love our family outings to Kilworth House theatre, in such beautiful setting. Yet another amazing show. Loved every minute of it. Brilliant cast and musicians and as usual the set was fantastic. Thank you to all involved, it was yet another fabulous evening. Always spectacular; we never fail to leave on a high wishing the evening would go on forever. Thank you to all involved. MAGICAL. First time at the theatre but won’t be the last. What a fantastic show everyone in it was great – the setting was excellent can’t praise it enough. Just wanted to send a note saying how much we enjoyed last night’s performance of Anything Goes. We will be trying to get more tickets to come again. Last’s performance was absolutely fantastic. Congratulations to all involved! I can assure you this has been the first time I have been compelled to contact a box office, post-performance, to say how good the show was. Thanks for a great and memorable night! Kilworth House is so lucky to have casted such a talented group of performers. A huge WELL DONE on your performance. Fabulous evening what a great performance a big thank you. Stunning performance – so much talent. Lovely evening. Kilworth House have got it all organised so well. Had a great night, it is a lively and extremely well presented performance. All the leads are to be congratulated……….. Well up to the standard we have come to expect at this lovely venue. Looking forward to Anything Goes. What a wonderful evening!!! The performance was amazing and rivalled any West End production. It was a truly memorable evening and we are looking forward to returning to future performances. A beautiful evening! A truly wonderful production of My Fair Lady at Kilworth House Theatre. That was something else! I will be back! Thank you for providing such an amazing experience at such a wonderful venue. Wow what a find. Friends and I went to see My Fair Lady and it was a absolute delight and easily compared to some West End Productions I have seen. It’s going to cost me a fortune as I want to see all the productions!!! 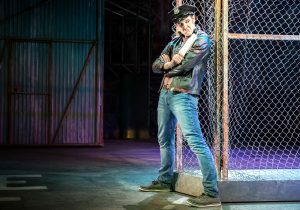 Oh we really could ‘have danced all night’ after MFL…..gorgeous production, we adored it…..every aspect of our visit is perfect each time, many thanks to everyone involved. We love Kilworth. Every good wish from me and all my most appreciative clients! Brilliant show, special well done to Neil Ditt ( aka bill ) ,the whole cast were great and then the fireworks, what a fantastic evening to finish off the jubilee celebrations, well done Kilworth House. We thought the show was fantastic; had a good laugh; true to form Kilworth shone. Yet another smash hit 🙂 The firework display was superb; what a way to end the Jubilee weekend; even the rain held off. Had an amazing evening. Thank you so much to everyone concerned for a truly spectacular night. Went to the opening night. What a show! To my mind, your best yet! In spite of the rain it was fabulous. The cast were superb, no weaknesses anywhere. The fireworks, with people singing patriotic songs, topped off a really wonderful Jubilee weekend. Last night’s performance was fantastic. The actor playing Billy really did the part justice. The only damper on the evening was of cause the weather as we do like to ‘picnic’ before a performance. Let’s hope that on our next 4 visits to the theatre we can indeed picnic. The Sound of Music is fantastic! Brilliant show, brilliant cast. Will definitately recommend it to all my friends and family. We really enjoyed it, thank you for a wonderful evening! Sunshine. Wine. Musicals. Kilworth House. These are a few of my favourite things! The Sound of Music at Kilworth House Theatre was amazing. In my top 3 of shows I’ve seen anywhere. Go and see it. It was better than the film! Well done everyone. Fantastic! I loved it so much I am bringing my daughter next week! When driving from Suffolk to Kilworth House Theatre know I can expect a treat. An outstanding performance, wonderful choreography, more enjoyable than the London version. Congratulations to all concerned, superb team work Best wishes for a successful run with good weather. Everyone seemed to be enjoying themselves. Saw Sound of Music Sunday night – it was a fantastic show in a wonderful venue with a great cast !! I have just got home after my first visit to your wonderful theatre. My Granddaughter and I have had the most fantastic afternoon imaginable. I really dont know what I expected from an outdoor theatre, but everyone there, the cast, the scene shilfters, the orchestra, backstage staff, front of house staff, car parking attendants. (I hope Ive left no-one out) all acted in such a polite professional manner. I shall certainly look out for more productions being staged and visit again. Thank you – Thank you – Thank you to everyone involved in todays show. I think we have just stopped crying (with laughter) from last night with Brian Conley (please have him back). Not even the rain could spoil a fabulous night started in great style by Adam. I have had to wait to send feedback this year as we have done so much so far I thought I might run out of superlatives. Pirates started the year in style, as always. Then we had 4 great nights Talon (legendary), Garry Mullen & The Works (that was Freddie? ), 10CC (back to my youth again fantastic) topped off by Brian Conley (tremendous). Phew, just a month off until we are back for Little Shop then our yearly outing to Christmas in the Orangery. Please keep doing what you do so well, you and the staff are a credit and we are so lucky to have Kilworth House so close. I really thought Stuart Neal (Semour) gave blood on Saturday night! He worked so hard but made the part look so easy it was a marvel to watch. 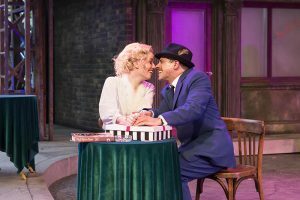 Along with Joanna Woodward (Audrey) and Steven Serlin (Orin-dentist) and the rest of a great cast, they made this one of the best shows we have seen at Kilworth. Audrey 2 was amazing where did they go to once eaten ? I don’t know how you keep getting better and better but you do. We are already looking forward to 2012 and what delights you will have for us. Please pass on thanks to ALL involved cast, crew and staff. I came to Kilworth House Theatre for the first time with my auntie last night to see Little Shop of Horrors. It was the first time I’d actually been to an open air theatre. We had a fantastic night. The show was the best version I’ve ever seen and I’ve seen a few with Little Shop being my favourite!!! 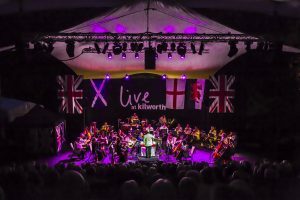 We were very impressed with Kilworth…the staff were all very friendly and helpful and the organisation of the whole evening was outstanding. We will certainly be keeping an eye out for your future performances and be returning soon. My daughter and I attended the show last night and were absolutely blown away! 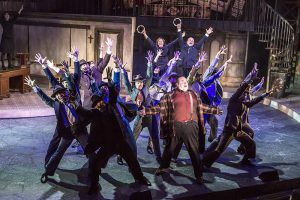 We have seen the show before else where and loved it but last night we were enthralled by this production – cast fab – music fab – staging brill and of course the setting there at kilworth House is amazing ! What a wonderful experience we had and cannot wait to come back and enjoy more superb productions. I feel the need to contact you with utmost praise for your production of ‘Little Shop of Horrors’. What an excellent evening we had, first dinner in the hotel ’10 out of 10′. Then the show, well what can I say that others haven’t said before. Staging, acting, singing, costumes, music, sound, special effects and lighting were all fantastic. I have been to many shows all over the world, and last night has to be up in the top three. Kilworth is a gem of a theatre, and cleverly has got it right! From the choice of productions to the small details (even the ladies toilets are clean). I now look forward to coming to your’ Christmas Cake’ entertainment in December. I book early each year for your productions and enjoy looking forward to the evenings all through the year. I just wanted to say thank you for the opportunity to attend the Kilworth House production of Little Shop of Horrors. We went on Sunday and it was brilliant! Saw “Little Shop of Horrors” last week, and thought it was absolutely brilliant, the cast were superb and we had a real good laugh. Another great evening at The Kilworth House Theatre. Little Shop of Horrors what a fabulous Show, brilliantly directed and performed by ALL of the cast. Thanks to all of you for a wonderful evening’s entertainment. (especially the mad Dentist – what a performance!) Loved It, Loved It, we could see it all over again. WOW! what about that plant!! Please bring the show back again sometime. Just to say a big thank you for an enjoyable day on Sunday to see Little Shop Of Horrors. We set off from Manchester in good time to travel to Kilworth. Arrived at 4.45, we had a look around the house, and what a stunning restoration you have done to the house. At 5.30 we waited at the entrance to the Orangery for our pre-theatre dinner. We enjoyed a fantastic meal in sumptuous surroundings. After dinner we jumped onto one of the golf buggies to head down to the theatre. The driver was very friendly and he was telling us all about the restoration. We then arrived at the entrance to the theatre, where a very nice lady checked our tickets. We then headed down the shady decked path to discover The Staging Post, it was like discovering a warm and friendly watering hole in the Swiss Alps. After a pint in the Staging Post, it was time to take our seats for Sunday nights performance of Little Shop. Seen Little shop a few times, and this production rates as one of the best versions I have seen. Grateful thanks to everyone involved with the production. And thanks to everyone who made our 1st Kilworth experience such an enjoyable one. I think a trip to Kilworth to see one of your production will be a regular event in my social calendar from this year onwards. Again. Many thanks to everyone at Kilworth House. See you next year. Last night was pure theatre heaven. We have seen ‘The Pirates of Penzance’ performed many times but never better. Mitch Sebastian is a superlative magician who simply makes everyone on stage into a STAR. We did not know which actor to watch as there were so many small episodes occurring at the same time. Just wanted to say thank you for giving ourselves and our party of friends once again such a memorable evening and lovely stay at Kilworth. of The Pirates of Penzance. Although we only live down the road, last night was our first visit to your theatre. The setting of the theatre is magical …. We had the most fabulous evening and felt transported to another world …In fact we could have stayed on and watched it all again. Please pass on our praise to all involved. See you at The Little Shop of Horrors. Just wanted to say what a fantastic Pirates of Penzance performance it was. Well done to everybody (including the ground organizers – superb control). We will certainly be coming again. We came for the first time to Kilworth to see The Pirates of Penzance last night. It was absolutely brilliant. Please pass on our exaltations to all involved. Really looking forward to coming again. I was lucky enough to get a ticket to see the show last week and just wanted to say it was brilliant! Very many congratulations to all involved both on stage and off on a fantastic toe-tapping, funny and highly entertaining show. Productions at Kilworth are always great and the whole experience a delight. Here’s to the next one and thanks again for a great night. Last night, my wife and I visited your hotel for the production of ‘Beyond the Barricade’ and a meal in your Orangery Restaurant. This was without doubt one of the best complete experiences that we have had for many years. We drove to the hotel through your most beautiful grounds and without exception, at the hotel, the service and attention to detail by everyone was exemplary. The food was excellent and really, fantastic value. After the meal, we enjoyed a superb show by an excellent group of people. Besides the enjoyment from them, we were amazed at the absolute attention to detail, both in the building of your theatre and now in every effort by your staff to give us a most enjoyable evening. The walkway from the car park to the theatre was beautiful and then for it to open out into that space with your ‘Log Cabin’ was fantastic. I am a hobby woodturner with a love for all things wood and The Staging Post was absolutely out of this world. 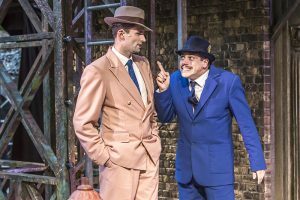 We felt we had to write to let you know just how much we have enjoyed your production of Guys and Dolls – so much so that last night we saw it for the third time and this morning booked to see it again on Sunday evening! We just wish it was running for a few more months so that we could have a weekly “fix”! Everything about the production is just amazing – the set, the plane, the music and of course the actors who seem to have been born to their roles. Thank you for putting on such a professional performance which has given us much happiness over the last few weeks. Hi, just a quick email to say how wonderful the show was on Friday night. Everything about the performance and Kilworth was top notch. I took some friends who had not been before and they were suitably impressed. We will be back for The Opera Show!! Once again, thank you very much indeed for the organisation of this booking. The performance was wonderful – each year seems to get better! On behalf of 90 people in my group, please convey “Congratulations” to all involved in the production. We all enjoyed a great evening. I would like to say a very big thank you to the crew, hotel staff and the theatre production team for a very enjoyable afternoon and evening on Saturday. Our party of ten thoroughly enjoyed the beauty of the hotel grounds, the welcome of the staff and the quality of the production. We are all looking forward to a return visit in the near future. Last night – another terrific show – great entertainment – dancing, singing, atmosphere. Cant wait for next year’s programme. Just a few words to say how much we enjoyed your performance of ‘Guys & Dolls’ last evening. I saw a touring production in Birmingham in the late 50’s and yours knocked spots off it. While typing this I am listening to the original Broadway production on CD and it confirms how close to the original yours was. Many thanks to all concerned. My Aunt takes us to the show each year and this is without doubt the BEST. Great performance and great organisation from you all. I just had to let you know how much my friends and I enjoyed our evening at the theatre on the 21st July. 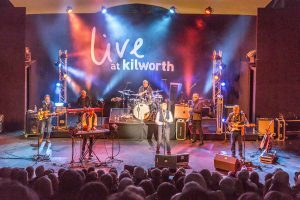 As avid fans of the Hollies we know what a great show they always put on but on both evenings that they have appeared at Kilworth there seems to be something magical in the atmosphere. The group always seems to have such a happy and relaxed time whilst proving how talented each and every one of the group are. The evening is made even more enjoyable by the way the whole evening is organised and great staff. 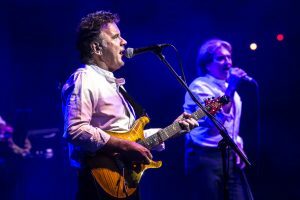 We all hope that you will be asking the Hollies to make a return visit as soon as possible as it is such a special evening even though we have to travel from Kent and Hampshire. Can you pass on our thanks and congratulations to all for a superb 2010 program so far! 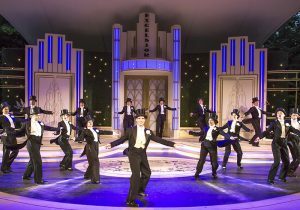 Guys and Dolls started our “yearly” bookings at Kilworth and was as professional as ever. The Manfreds and last night The Hollies were just superb and thanks to all the crew who look after us so well. Now looking forward to Christmas in the Orangery again for our 5th year. Looking forward already to 2011 – don’t know how you can top 2010 but I bet you do. Keep doing what you do so well. FABULOUS, FABULOUS, FABULOUS – thanks for an absolutely wonderful 10CC gig last night. A superb group of musicians with songs everyone knew and a flawless performance by all. You just keep getting better. Rain – what rain ? See you later for Queen! Singin’ in the rain had nothing on last night. What an absolutely fabulous show and how everyone soldiered on throughout the worst rain of the year, deserves a round of applause! Please tell all involved that it was much appreciated. We would like to offer our sincere thanks and congratulations to all concerned in giving us such a wonderful evening at Kilworth House last Thursday. It was our first visit to the Hotel and Theatre and it certainly will not be our last! The dinner was just right for a summer evening – the Orangery and the surroundings really superb. Imagine our delight at seeing the outdoor theatre in such a lovely setting. As for the show itself, we were completely enchanted by the sheer professionalism of the production. Let us also praise the meticulous attention to detail exhibited by all of your staff – we were really made most welcome by all concerned. We heard “enjoy the show” or ” enjoy your evening” many, many times and that all added to the happy ambience of the occasion. We sincerely acknowledge and praise the sheer enterprise of Mr & Mrs Mackay at Kilworth House and wish them both all success in the future. Many thanks for your kind assistance with the group booking. Everybody thoroughly enjoyed the performance, and indeed, the whole evening. It was first class in every respect. I know the weather was with us but everything exceeded our expectations. The Staging Post looked super, the food was great and the crew looked after us splendidly and the show was the icing on the cake. Please give our thanks to all involved and be rest assured we, (and I am sure most of our guests), will be back at Kilworth before too long. And this is to say that the organisation at KHT is brilliant, the best I have come across in many years of theatre, outdoor events, etc. Simple things like good car park lighting when one leaves, bar staff that really hurry in the interval – and smile at the same time, etc. Oh, and the show was excellent. I have just arrived at home in Wigston from the Queen concert at your theatre and I felt I had to say what a wonderful evening it was… Even down to getting out from the car-parks, the organisation was brilliant. No traffic jams, it was so easy! Please convey our thanks to ALL of the staff involved for a great evening… Hoping to see you all again soon. We are so lucky to have this sort of venue on our doorstep. Already watching out eagerly for next year’s acts. See you in September for The Opera Show. Last night your team’s rigorous pursuit of excellence in voice, music, dress, production and a joyful embrace of risk, shows what can be achieved in the face of the current drift towards mediocrity where banality is raised to an art form and the avoidance of risk has become the new professionalism. Your show stood out as a beacon in a turgid world; congratulations, well done, maintain the very high standards you have achieved and enjoy the success that is undeniably your right! On Wednesday evening I brought my husband and two good friends to Kilworth for The Opera Show. The show itself was stunning. But the setting and the theatre in action were something else! Granted it was a lovely evening which helps. But even so, you could not have improved the glorious setting – the lighting in the trees makes you feel as though you are in some enchanted fairy world. Everything was made so easy by the lovely people organising the parking and running the event. If I had been the lady responsible for creating this amazing theatre I think I would be beside myself with delight. Please pass on my congratulations and we will be back! You have such strong visual and musical performances, witty and beautiful, everyone wanted to give a standing ovation but the blankets on their knees got in the way! I would buy any tickets that came up and go again – please can you keep my details and let me know if there are any returns no matter how last minute! to thank you and all involved for a truly memorable evening. Dinner was delicious and the show was brilliant, so original and hugely professional. Your staff, as always, were very efficient and welcoming. We will be telling all our friends so do hope we shall be able to get tickets for the next show, which we look forward to enormously. As you know the Yells and ourselves came to The Opera Show last night . We all thought that it was a superb evening of voices, dancers and musicians. You are to be congratulated on a wonderful show. We would like to offer our sincere thanks and congratulations to all concerned in giving us such a wonderful evening at Kilworth House last Thursday. It was our first visit to the Hotel and Theatre and it certainly will not be our last! The dinner was just right for a summer evening – the Orangery and the surroundings really superb. Imagine our delight at seeing the outdoor theatre in such a lovely setting. As for the show itself, we were completely enchanted by the sheer professionalism of the production. Let us also praise the meticulous attention to detail exhibited by all of your staff – we were really made most welcome by all concerned. We heard “enjoy the show” or ” enjoy your evening” many, many times and that all added to the happy ambience of the occasion. We sincerely acknowledge and praise the sheer enterprise of Mr & Mrs Mackay at Kilworth House and wish them both all success in the future. Many thanks for your kind assistance with the group booking. Everybody thoroughly enjoyed the performance, and indeed, the whole evening. It was first class in every respect. Another 128 satisfied customers!!! There is successful, reasonably successful and stunningly successful and Tuesday night definitely fell in the final category I know the weather was with us but everything exceeded our expectations. the crew looked after us splendidly and the show was the icing on the cake. Please give our thanks to all involved and be rest assured we, (and I am sure most of our guests), will be back at Kilworth before too long. I would like to say what a wonderful evening my family, friends and children had at your theatre last night. I was most impressed by how many marshalls and staff you had. Things ran so smoothly and worked so well. The blankets were a fantastic idea, the bar was not overpriced, the programs were not overpriced and yet the Theatre, staff and surroundings are all such high quality. I would like to extend my particular thanks to the young bar man in the interval who not only helped me with interval drinks but also searched out the rest of my party and brought us all together. What a switched on and polite person he was. This was on top of a wonderful show. I was amazed by the great sound and lighting, this must be hard to achieve outdoors. The actors, of course, were the best. Well done and thank you very much I look forward to coming again. Just another big thank you for a fantastic evening. Please pass our thanks on to all concerned. Katy, and everybody at the Staging Post, worked very hard to make our evening a big success. I wanted to take this opportunity to pass on our congratulations to the cast of Oklahoma!, and the unwavering professionalism of Kilworth Theatre Staff for the production on Saturday 21st June 08. 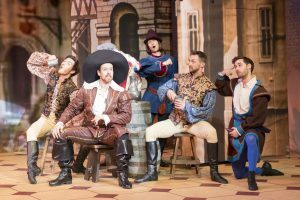 With the exceptionally high standard of last year’s Pirates of Penzance production to live up to, Oklahoma smashed all expectations, so much so that a number of our party have already booked to see it again! Whilst the whole cast delivered their parts impeccably, special praise should go to Abi Newberry, who was also wonderful in Pirates and really stole the show this year, Steve Elias and Scott Cripps who were perfect as her love rivals. The theatre is a true gem, made better with the addition of the new facilities block and we are all looking forward to returning to the Last Night of the Proms this year and your next production in 2009. Brilliant – I have never laughed so much for ages and even shed a tear in places. I also plucked up the courage sing along at the end. Please pass on our thanks to the wonderful cast and of course all the crew. We even had good weather this time, made the afternoon extra special. Just a quick note to let you know what an absolutely fabulous show we attended yesterday afternoon. Thank you all so much for providing such high quality family entertainment. It was our daughter’s first trip to the theatre (she is 8yrs) and she was enthralled with the whole performance and all the staff were very kind to her. Keep up all the good work. We have just booked for the opera night in September – can’t wait!!! I am writing to let you know how much my mum & I enjoyed the Oklahoma matinee yesterday! 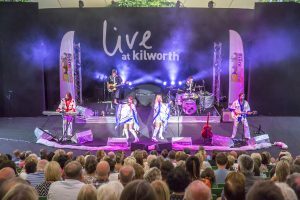 It was the first time we have been to Kilworth House Theatre and we both thought it was fantastic – the theatre is set in beautiful surroundings, the event was well organised and all the crew were happy & helpful. I can’t believe I hadn’t heard of the venue before now – we will definitely be visiting again, we’re just disappointed the season ends in July! Congratulations to everyone at Kilworth House Theatre for a wonderful “Oklahoma experience”!… to Richard and Celia Mackay, the production team and cast, box office, catering team and all support staff. Every person in my group of 125 people thoroughly enjoyed last night’s performance… it didn’t even matter that it rained…. it was an excellent production, brilliant in every way. Also, the 97 people in my group who booked the pre-performance buffet were very impressed with the meal in both the Staging Post and the Marquee. Thank you, Alison, for all your attention to detail in my group booking arrangements. I look forward to the production next summer! had a wonderful evening and enjoyed Oklahoma enormously. The calibre of the actors and actresses, and the quality of the dance, the vocals and the choreography was exceptional. It was a real treat to be part of such a special event. Congratulations on hosting another amazing musical extravaganza. Wishing you a very successful season. The theatre setting, the weather, the scenery, the show yesterday was magical, we all thoroughly enjoyed it. Thank you for a fantastic evening last Saturday. The Opera Show was unbelievable, it was a truly wonderful mix of operatic music and dance. The whole cast of singers, dancers and musicians were superb. the first being Oklahoma! (which was also brilliant) and we are looking forward to future productions. Who needs to go to London for first class theatre shows when we have Kilworth House Theatre on our doorstep. Thank you and all the supporting backstage staff for making it such a memorable evening. I would like you to pass on my congratulations to all the stagecraft staff, the singers, dancers and production staff for staging the Premiere of what was one of the most unique and original productions I have ever seen. I attended The Opera show last night with friends and family including someone who had never heard a piece of opera before plus my 70 year old father who is a very traditional classical music “buff” and who likes “old fashioned” singers singing their pieces in the way the composer wrote them. To say that we were all blown away in amazement and rapture would be a huge understatement. My father was first on his feet applauding like mad at the end and shouting for encores! For a 70 year old traditionalist to be that overwhelmed is a credit to the professional and innovative brilliance of the show. The show was marvellous, breathtaking and brilliant! Well done again to Kilworth House Theatre and To Be productions for this masterpiece of theatre and opera. Where else will it be on? I would love to see the production again and can think of several people I’d like to get tickets for – to show them Opera is not boring, dull and “all in foreign” as they think now! I’d happily have come to see it every night at Kilworth if only I had known what I treat I was getting. BRAVO and absolutely ENCORE. My wife and I were privileged to attend Saturday night’s performance of The Opera Show. The standing ovation was due reward for a sensational event – absolutely excellent. I should be very grateful if you would pass on my comments about The Opera Show to Celia and Richard Mackay and Mitch Sebastian. My husband and I came with friends on Friday evening and really didn’t know what to expect. We assumed that someone would simply sing a piece and then leave the stage! What a fantastic surprise and treat. It was one of the most memorable pieces of theatre I have ever seen. I think the imagination and creativity behind it is just astounding. I would very much like to know if you are likely to tour with this show because I would make sure that our friends came to see it. Congratulations and thank you for an absolutely fabulous evening. The Opera Show on Saturday was fantastic. Many congratulations to the To Be team on putting on such a treat. The first act was sumptuous, the second act was truly extraordinary and moving and the third act was a triumph. Many, many congratulations and good luck to the performing company for the future which we know will include great success. My wife and I together with two friends went on Sat 6 Sept. It was the best show we have seen anywhere including London shows. Every person we spoke to, raved about it. If it returns, let us know. [Could go to the States to watch it I suppose!]. night and we were all just blown away by the performance. It was a fantastic experience (apart from the weather, and we felt really sorry for the cast and musicians trying to keep instruments in tune) and we loved every minute of it. Unfortunately, I missed Act 3 as one member of our party was taken ill and had to be driven home, but I wanted to congratulate all involved in the show on a wonderful performance. I do hope that you will put it on again next year – I know all the friends I came with will be queueing up to come again. your absolutely fantastic show. We came away unable to find words to describe the experience we have just enjoyed. Everything was wonderful – the voices, the dancers, the interpretation of the pieces both musically and movement, the costumes, the design – I could go on and on. Please convey our sincere thanks and admiration to everybody concerned for a production that can only be described as INSPIRED!! Here’s to future productions and success in venues throughout Europe, USA and The Middle East. Four of us attended your inaugural show last night and were so delighted by the quality of the entire production that I just had to tell you so. Despite the weather it was truly magnificent! A superb company supported by outstanding sets, lighting and sound quality. May we wish you all success for the future. Thank you for such a wonderful value for money evening. Just wanted to let you know what a truly fantastic evening my husband and I had watching The Opera Show. The weather did its best to outdo the performers but absolutely nothing could spoil the first rate singing and dancing. This was our first visit to this venue and from the minute we arrived the friendly and helpful staff made it a pleasant experience. I have never had such an enjoyable evening (and we are lucky that we’ve been to many live shows). We will most certainly be singing the praises of your theatre and have every intention of coming back on a regular basis. I would happily have sat through the next two performances!! With friends we attended the Elkie Brooks concert last night. She as ever was fantastic and just gets better and better. But my congratulations are to everyone involved in the wonderful facility of the theatre and Staging Post – it was fantastic and took your breath away. If only the weather had been better – we cant wait to attend many other events. What a fabulous evening last night at Kilworth watching the ‘Hollies’. Everything about it was just like the hotel i.e. attention to detail. The band were brilliant, the seating, lighting, hospitality and the scenery was just fantastic. What a lovely evening and hopefully many more to come!! Just wanted to write to congratulate you all on the wonderful performance of the ‘Pirates of Penzance’ that we were thoroughly entertained by last night. The Cast, Orchestra Lighting, Back stage staff, car park attendants, in fact everyone associated with the whole evening (even the audience) were so professional that my family and I decided it was the best ever production of ‘Pirates’ that we have seen. Bravo to you all and you can be assured of our return booking for next year’s production. (Whatever it may be). Well Done Kilworth you certainly know how to live up to your reputation. Thanks for a great evening on Tuesday. The theatre worked well and it was a good choice of show. The staff were excellent. I am sure that the rest of the season will be just as good. The theatre will make a huge contribution to the local leisure and culture offer and will be a tremendous boost for the area. Congratulations to all who were involved in the project. We both thought last night was superb in every way. It is a lovely setting, talented cast and musicians who were all in character with the plot and really well staged. The camp cops were hilarious. Absolutely loved it. the performance was marvellous and the thunder and lightning added to the atmosphere – how did you manage to time it to stop for the interval!! Congratulations, congratulations, congratulations. What an absolutely stunning show last night. We are great G&S fans and have seen many productions, but none were as brilliant as last night’s production. The enthusiasm of the cast and orchestra came through and even the thunder storm did not detract from what was a memorable evening. Having seen the theatre in an unfinished state, we were very impressed with the whole set up. We are looking forward to our next visit. My partner and I came with four friends to the Wednesday matinee of “Pirates”. Wow! What a brilliant production. This is just to say well done all of you. I have seen many G&S productions over the years and yours was way the best one. A wonderful, young (mostly!) cast and imaginative production, with superb use of the scenery and site. The musicians were excellent and I did speak briefly to your conductor afterwards (lovely knees!) to say how much we had enjoyed it. Please mount another G&S next year and I shall try and bring a bus-full! We’d like to congratulate anyone who had anything at all to do with the production of Pirates. 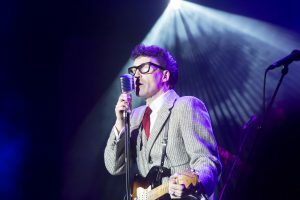 We came for the first time on 21st June and were completely blown away by the production. So we had to come again – last night, when the weather did its worst. We were even more impressed – if possible – second time around. 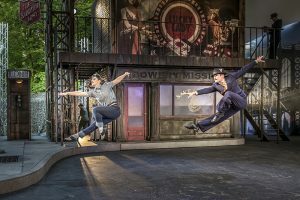 It was clear that this thoughtful and entertaining production brought G & S to life: the verve and exuberance of the whole thing was totally uplifting -and I haven’t even mentioned the weather yet. Well done on your opening production. Please do another G and S next year and we’ll try to come five times! You deserve every success after such sunny determination in such dismal weather. a theatre performance. However, I have to congratulate you all on a fantastic production of Pirates. I have seen many G & S shows, but this far outshone them all. Please ask this company back next year! The venue also merits a mention, it also is fantastic! I hope it goes from strength to strength and we look forward to supporting it in the years to come. I came last night to the opening performance of PoP. Despite sitting in the seats nearest to the orchestra, where the weather did its level best to hamper things, I thoroughly enjoyed every moment. You will surely never get a harsher test for an opening night. The pre show meal was good, the theatre setting and design both fantastic, and the show was brilliant. Can’t wait for the next production. WELL DONE. ‘The Pirates of Penzance’ was a tremendous entertainment. We thoroughly enjoyed the whole ambience, the site, the construction of the stage and surroundings were quite breath-taking. the theatre company was marvellous, the bar staff friendly and helpful. Even the weather was kind to us, in all a fantastic evening. Look forward to more events. A friend and myself came to Pirates on 7 July and last weekend we came to the Last Night of the Proms concert. Both were wonderful evenings. Everything was superb. We enjoyed our pre theatre dinner with plenty of time to spare. Staff were wonderful, attentive, helpful and most importantly these days, smiling. It was so helpful having people to greet you when you arrived. This must be a great success for you and we look forward with great anticipation to the next season of concerts.